From case studies to conference presentations, the 2018 contributions of the Ally Community sparked new, global conversations about accessibility, inclusive learning, and universal design for learning (UDL). The stories and discoveries shared by members of the Ally Community through activities like the Community Forum Series and Community site have helped drive innovation in campus accessibility strategy and inclusive learning pedagogy. In our efforts to continue to connect and amplify voices in our Community, we’re kicking off the 2019 Ally Tour. The Ally Team will be circling the globe one campus at a time to learn more about how institutions are tackling their toughest accessibility challenges and measuring the impact of inclusive learning experiences on student success. What’s Going Down on the Tour? The Ally Team is spending 2019 on the road, visiting Ally campuses to gather first-hand accounts from instructional technologists, accessibility coordinators, faculty, and students about how accessibility and Ally are impacting teaching and learning. We’ll be sharing what we learn along the way, carrying the anecdotes and lessons from a growing community of inclusive learning innovators to each destination. We’ll also be digging into Ally usage data and findings from case studies for insights into overall trends and engagement. At each stop along the tour, we’ll be producing podcasts with Ally service leads, conducting video interviews with students and faculty, and blogging about the entire journey in the “2019 Ally Tour” space on the Ally Community site. By the end of the Ally 2019 Tour, we’ll have woven together campus voices and research from across our Ally Community into a global portrait of inclusive education. We hope the artifacts created during our journey will help blaze new pathways for accessibility advocacy, technological innovation, and inclusive learning design. Stay involved in the conversation at tour.ally.ac as well as on Twitter and Instagram by posting questions, comments, and sharing your own experiences. 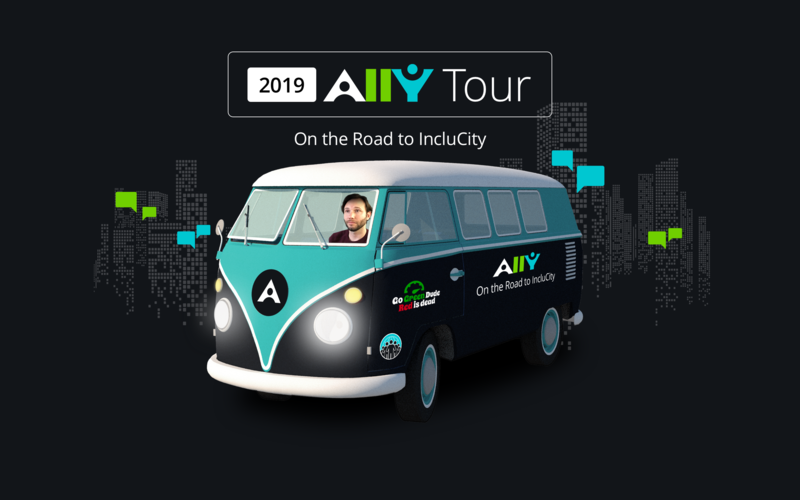 See you on the road to IncluCity!